To help you learn about our church family, here are answers to some questions you might have. For more information, fill out our Connect Card. WHERE IS FIRST BAPTIST CHURCH ROUND ROCK? WHERE DO I PARK WHEN I ARRIVE AT FBCRR? Visitor, senior, and handicap parking is available in designated areas near our two main buildings, the Sanctuary and the First Life Center. General parking is available in several adjacent parking lots. 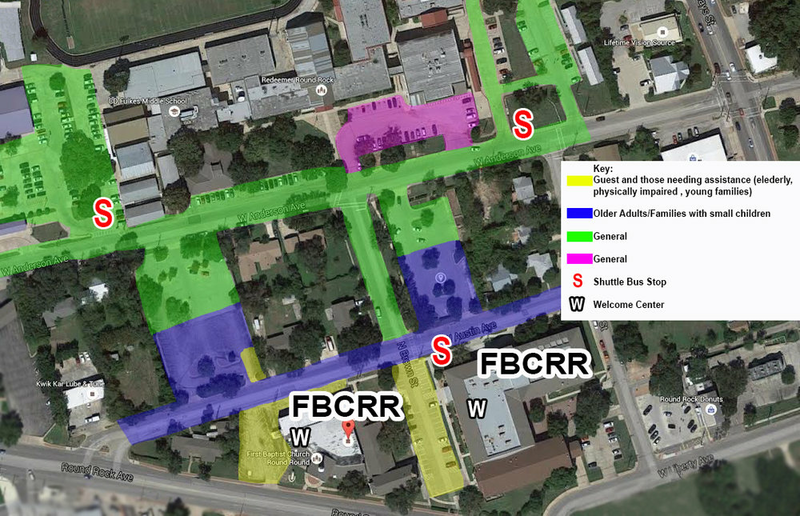 Street parking is located on the north and south sides of our campus, across Brown Street, or on the east and west side of our campus. Door greeters will direct you to the nearest Welcome Center in each building. WHERE DO I GO AFTER I PARK AT FBCRR? Once at the Welcome Center, our Welcome Team will greet you with a smile and fresh brewed coffee. Planning to join us for worship? Want to meet a new friend in a same-age or same-gender Bible Study? Have small children or youth that would like to fit in as they hear about Jesus? Our friendly Welcome Team is happy to answer any questions you may have about our church and ministries. Our attendance has been increasing. That is a good thing. However, with increased attendance comes a strain on our Sunday morning parking for our three worship services and Bible Study hours. To make the most of our parking, accommodate our guests, and provide easy access for those needing assistance, near parking for older adult and families with small children and general parking are available at suggested locations. HOW DO I FIND A BIBLE STUDY? Bible Studies are offered at 8:30, 9:45 and even 11:00 AM. We have Bible Studies for all ages and life stages. At FBCRR, you will find people your own age learning to apply God’s Word to everyday life. The Welcome Team is happy to review the list of available classes and take you to the specific classroom. Classes for Senior Adults are conveniently located near the Sanctuary for easy access to worship. WHAT IS AVAILABLE FOR KIDS ON SUNDAY MORNING? At 8:30 and 9:45 we provide Bible Study or Club 4K for all children through Kindergarten in our spacious preschool area. At 11:00 we offer Extended Teaching Session for Birth through fours while Kindergarten children attend "Big Church" with their family in the sanctuary. We take every precaution to assure your child's safety and security, including a computerized check-in system. The preschool area is equipped with both indoor and outdoor play areas. Click here for more information about First Steps Preschool Ministry. For children in 1st – 6th grade, 8:30 AM Kids Praise worship is a fun time to gather together with a time of singing, games, and fun. The 9:45 AM hour is a small group Bible Study time to get into the Word and learn about Jesus. At 11:00 AM, grade school age children are able to attend “Big Church” at family worship in the Sanctuary. Click here for more information about First Kids Children's Ministry. Our student ministry, for grade 7 – college, meets for Bible Study from 9:45-10:45. The 9:45 hour is the primary student gathering time, with High School and Middle School groups opening together before dividing into small group Bible Study divided by grade. They're sure to be met by a host of welcoming youth and maybe even a doughnut. All of our students are encouraged to attend worship with their families and can do so at either the 8:30 or 11:00am worship in the Main Worship Center. Click here for more information about our Student Ministry. Our 8:30 service is contemporary in style and is located in the Main Worship Center. The music is high energy and led by a praise band. The 9:45 and 11:00 AM worship service, in the Main Worship Center, is a blended style incorporating both the traditional and praise style worship. It is truly a mix of inspiring music ranging from old time gospel quartets to inspirational choir arrangements to meaningful choruses and traditional hymns. We encourage you to be comfortable and wear what suits you. You will see casual "come as you are" attire, business casual, and some coats, ties and dresses. Don't think about it too hard--just join us! We're looking forward to seeing you! How Do I plan my visit to FBCRR? We want your visit to be as enjoyable as possible, and hopefully, the information in this FAQ has answered your questions. However, if you have further questions, click the button below to submit your question, and we'll get back to you as quickly as possible with an answer! So now that you've chosen the service or Bible study you'll attend, picked out your clothes, and selected the parking lot closest to your destination--why not take a few minutes to PRE-REGISTER from your home computer or device? When you arrive at the Welcome Center Sunday morning, we'll already have your information. This will make for a smoother transition into a class or service for you and yours. If you're bringing children with you, please be sure to note any allergies or special care instructions to ensure an enjoyable experience for your little ones. You may be wondering what will happen after you visit. That's really up to you! We would like to get to know you more and help you find ways to plug in at First Baptist Church. Hopefully, when you pre-register online or visit the welcome center upon arrival, you will tell us the best way to contact you! If you would like to connect with us after your visit or even right now, click here and you will find a Connect Card. Fill out the information and hit submit...its that simple! We are looking forward to your visit! We hope you will enjoy your time with us and feel like a part of our family! How do I become a member of FBCRR? Membership at FBCRR is highly valued. The best way to understand membership is to connect with one of our staff members. We would love to answer your questions and chat with you about what goes on at here FBCRR and how you can be a part of our growing community. Call us at 512-255-3454 or email us at churchoffice@fbcrr.org.